I had the joy of spending time with the Cowles this weekend. I love them. I love their easy way. I love eating with them. When I pulled up, the chickens were running around. You might think they live out in the country on a farm, but no, they live smack dab in the middle of the city. They have a very large back yard for a city lot. And it wasn’t one bit unusual for me to see chickens in the yard. I love the Cowles. I had made Butternut Squash Ravioli prior to that visit and thought I’d share with them. They were so sweet to invite me to stay for dinner, which I LOVED. E made grilled pork tenderloin and roasted asparagus. The sauce for the pork was SO GOOD. She just whipped it up out of jars of sauce. She’s so good like that. It’s a recipe that’s not for everyone and I knew they would appreciate it. The recipe comes from Giada and can be found here. Her recipe calls for it to be made into tortellini, but I made them into ravioli so there was more filling. I recommend making it in stages. Roast your squash and make the filling ahead of time. It can be frozen. The ravs can be made ahead also and frozen. The sauce should be made as the ravs are boiling and should always have fresh sage. Wonton wrappers can be found in the produce section of most groceries near the tofu. Talk about an easy way to make ravs! B suggested filling variations including spinach and cheese. The possibilities are endless. 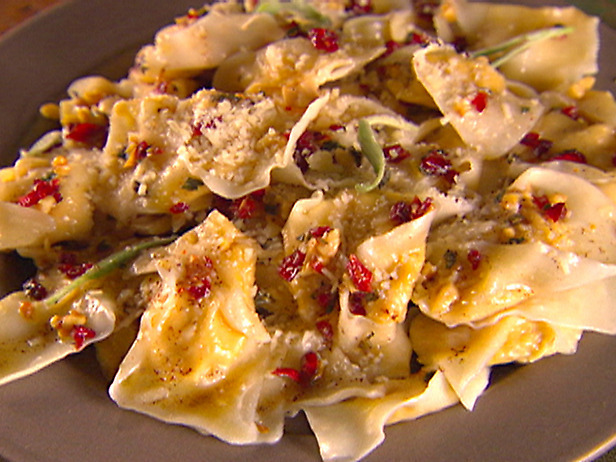 The sauce is brown butter with fresh sage, cranberries and walnuts. It’s the perfect combination of savory and sweet. With the silky goodness of the butternut filling – oh my…makes you want to eat way too much. Thank you for a wonderful time Cowles family. I look forward to it again.